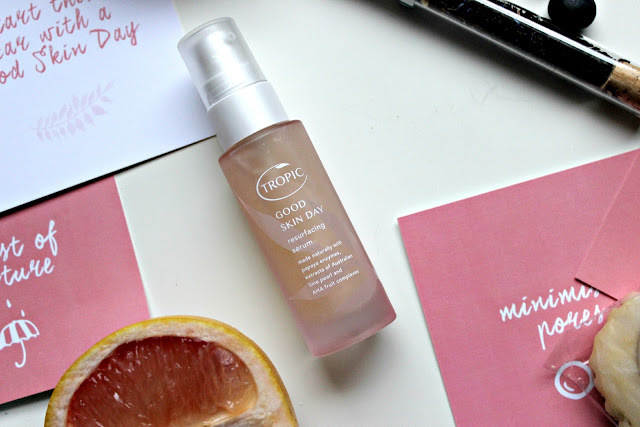 You may have seen my post of Tropic's Super Greens Serum a couple of weeks ago, where I spoke about all things Tropic and you can read that here for more information on the company and their ethos if you'd like to familiarise yourself a bit more, but for today, I'm just going to jump straight into the product itself. Tropic's Good Skin Day Resurfacing Serum is a fruity little cocktail of AHA and BHA acids designed to rid you of dead, dull skin and leaving your face radiant and bright with a lit from within type glow to it. While I have used chemical exfoliators before, it seems that the idea of them puts the fear of god into some people, it seems odd to me that these same people are more than comfortable scrubbing their face with abrasive micro beads without a second thought. I think it may be the idea of putting acid on your face which might not sit well with some, however with AHA acids derived from Australian lime pear extract and fruit acid complexes and BHA acids from willow bark extract, this serum does nothing but wonderful things to your face. No burning, no tightness, just lovely, fresh skin. The unique combination of AHA and BHA acids help to encourage collagen production while deeply exfoliating. Hyaluronic acid is also added into the mix to help with plumpness and hydration. 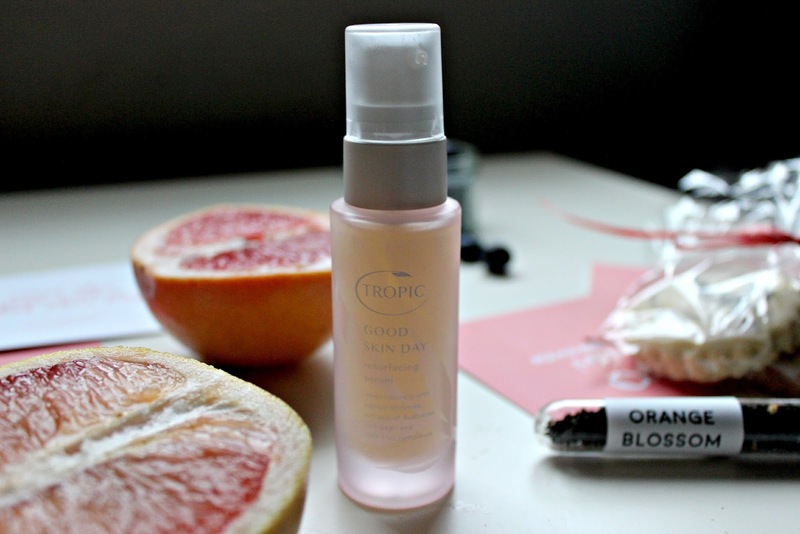 The first thing I noticed about the serum, before I even applied it to my face was the gorgeous smell. It's super fruity, and if I didn't know any better, I'd have probably considered ingesting it - not recommended, do not do this. The serum includes papaya enzymes and probiotics to minimise pores, lemon extract to help with brightness and mango extract to protect against free radicals (yes, those pesky things again!) and in turn, preventing premature ageing. Coconut water is also included in the serum for added hydration and you can probably see now why it smells so good! What I really like about this serum is that it's oil free. I feel that this differentiates the serum from a lot of others on the market. Despite its lack of oil, the serum still manages to be super hydrating. As someone with sensitive skin, I can vouch for the fact that it doesn't burn skin. While Tropic recommend a patch test if you're worried about the serum on your sensitive skin, I just went for it (because it smelled SO good!) without any problems, but of course, if you are concerned, it can't hurt to test beforehand. Once on, there is a definite tingle, but no burning. Just enough so that you can tell the serum is working its magic. It's not uncomfortable and lasts around sixty seconds. 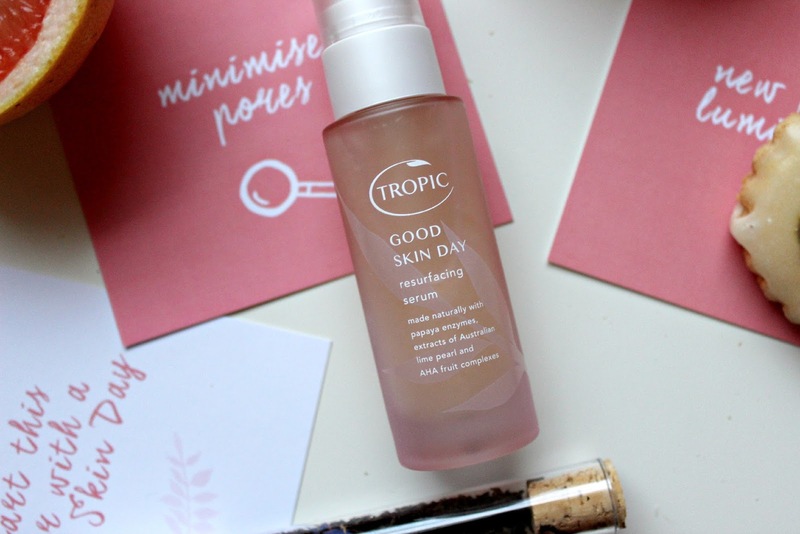 I apply about three pumps of the serum at night after cleansing about three times a week, and apply my moisturiser with SPF the following day as recommended by Tropic due to the increased sensitivity to UV rays after resurfacing. I have noticed a real difference in my skin in the time I have been using Good Skin Day. It's brighter in the mornings after use and I've found that makeup glides on much better also that morning and in the following days between usage. It feels soft and smooth and not at all uncomfortable or tight as I have found with some chemical exfoliators in the past. I feel like I look healthier and have noticed that even during this horrible cold I have at the moment, after using the serum, I look much more awake and slightly less like a zombie. let's bring some interaction back into the blogging world. © Life of Laura | All rights reserved.